I'm sitting here actually looking for a beginning, I have one eye on my pan of milk, I am making my home-spun latte drink, my favourite and far better than going out and buying one everyday, which I used to do! and now I save myself a tidy sum every month. I buy the little Starbucks sachets and only use half, so even though it may not be the cheapest, and I am not a really strong caffine drinker, it does the job. I spend the rest of the day drinking tea. It's amazing how much tea can be drunk. One day soon hopefully I will start up on the herbals again and become reformed.......! 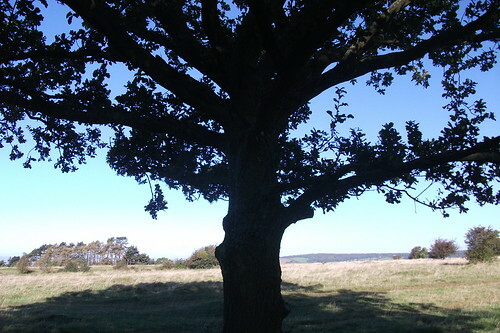 Okay all whisked and frothed now and and a silhouette picture of an oak tree on the common for you to see. So I will drink this while I tell you what I've been up to. White paint, let me tell you, it changes everything! I have learn't a lot doing this, it makes you re-consider everything, which suddenly comes into the foreground. Whereas before with my earthy colours so much was able to be over-looked and blended in. I question whether I have done to right thing, especially at the beginning of Autumn..... I'm feeling very Scandinavian or perhaps I will go bright and eclectic, or maybe both!! Throws will have to be changed, warm colours need to be added. A lot of bits and bobs simply don't fit any more. I may have to add a mocha/latte colour wall at one end! suddenly I'm thinking about corals and dark grey..... I thrifted the most amazing cream/beige crochet table cloth this morning, with a most spectacular border and a beautiful silver candle stick. Maybe it will all fit. I wonder, you know, why now?.......I blame all the gorgeous blog reading myself! !........It's funny when you decide you want to do something and spend hours agonising over it and then do it anyway and wonder why it was so important to do it..... fresh feels good and it's something new to create with. I have spent a lot of time reading Homespun style, which I love. The white works so well with all the floral goodness there, but perhaps it does have more of a summer feel to it. So the challenge now is to work it up to cosy. Some beautiful woollen rugs and lots of crochet. It's also a nice backdrop to photo my crochet against. Which really is probably the real reason I did it! sorry to sound like a women obsessed! I know some of you will understand. I should probably get my self out in the garden and give it some attention instead, but you know a girls gotta do what a girls gotta do! I'm just gearing myself up for major decoration, will love it afterwards but hate the doing bit! We've got to have a ceiling down, and all I can think of is the mess! While that's down, we might as well have the walls replastered and new tiles around the work tops! Yikes!!! I know just what you mean about white walls. We did a gut renovation on our little old lady house last year and I wanted all the walls to be white to start with a blank slate. But sometimes I wonder if it's a bit tooo white. My solution is to have lots of colour around the place which seems to work well. You won't regret it! Yep, I 'write' in my head, in the shower usually, then...forget the what, the how and the why! I sigh very deeply about the beautiful, vintage, pretty homes in blogland, tho I am trying in a teeny weeny way to add bits and pieces and The Family just look at me and say "mum, really?" bless their hearts. (I think my tomboy teenage daughter is coming around to my way of thinking, yippee!). Your home looks lovely and it will be worth it in the end. You need to walk out of the room for while then walk back in to really 'see' the results. Good luck. PS Tea, yum, my time off/therapy - as I have milk and 2 *cough* 3 sugars I can only manage 3 beakers a day (how Hyacinth Bookay - cups are too small, pretty china mugs/beakers too expensive and the pretty cheap pottery mugs too heavy) larf. PPS I am a 'secret' blogger and I have no idea what I am doing/don't how to pretty it up and I can't ask techno sons. Is there a 'blogging for idiots' page anywhere that doesn't expect people to automatically know what a URL is?!? I think white works with most things and all seasons, but what does change is the mix of things that is effective ... I think you need a carefully planned colour scheme with white, be that brights, neutrals with an accent colour, etc. ... just not too much blue or it will feel cold. I wanted white and the Mr persuaded with me it would be easier to cover the existing coffee colour with a darker coffee colour ... I am really regretting that, in fact I might be wielding a paintbrush too soon! Some times while hoovering and cleaning, thoughts just come to me of what to write. You have inspired me too pick up my crocheting hook again! Wishing you a Sunday full of kindness.